Learning stairs are on the rise and being designed in more and more educational environments as a means of promoting social interaction and connection, as well as physical activity and wellness. 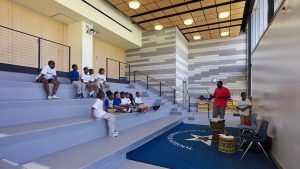 The versatile nature of the learning stair provides both a formal and informal area for gathering, teaching, transporting, socializing and performing in a highly flexible, amphitheater-style environment. This is not a novel idea, as the history of stairs dates back to the first human structures, yet learning stairs are now re-surfacing as an active design concept in educational environments becoming a multipurpose, student-centered spaces.